Melania Series There are 11 products. 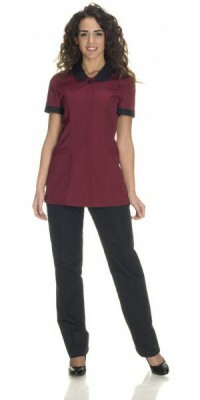 Women's short-sleeved tunic, model OlgaBurgundy, with button, collar and sleeves profile in BlackImmediately available for delivery: sizes from XS to XL Made of Lightweight Soft-Feel Gabardine, 50% Cot., 50% Pol. Women's short-sleeved tunic, model OlgaEcru, with button, collar and sleeves profile in BlackImmediately available for delivery: sizes from XS to XL Made of Lightweight Soft-Feel Gabardine, 50% Cot., 50% Pol. 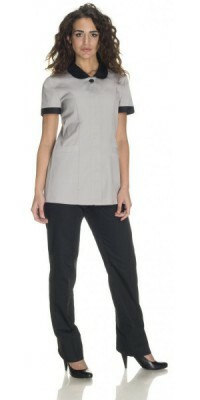 Women's tunic, model Emma short-sleevedLight Grey colourImmediately available for delivery: sizes from XS to XL Made of Lightweight Soft-Feel Gabardine, 50% Cot., 50% Pol. Women's short-sleeved dress, model Melaniadouble-breasted model, with rear slashIron Grey colourImmediately available for delivery: sizes from XS to XL Made of Lightweight Soft-Feel Gabardine, 50% Cot., 50% Pol. Women's short-sleeved dress, model Melaniadouble-breasted model, with rear slashBrown colourImmediately available for delivery: sizes from XS to XL Made of Lightweight Soft-Feel Gabardine, 50% Cot., 50% Pol. Women's short-sleeved dress, model Melaniadouble-breasted model, with rear slashLight Grey colourImmediately available for delivery: sizes from XS to XL Made of Lightweight Soft-Feel Gabardine, 50% Cot., 50% Pol. Short-sleeved dress, model Dafne rear slash and zipper on the back Light Grey colourImmediately available for delivery: sizes from XS to XL Made of Lightweight Soft-Feel Gabardine, 50% Cot., 50% Pol.